The Malish Corporation, a global leader in the manufacturing and marketing of rotary/disc brushes for commercial floor cleaning machines, along with a growing line of janitorial and foodservice/color-coded brushes, has launched a new corporate website that promotes all Malish products and services. 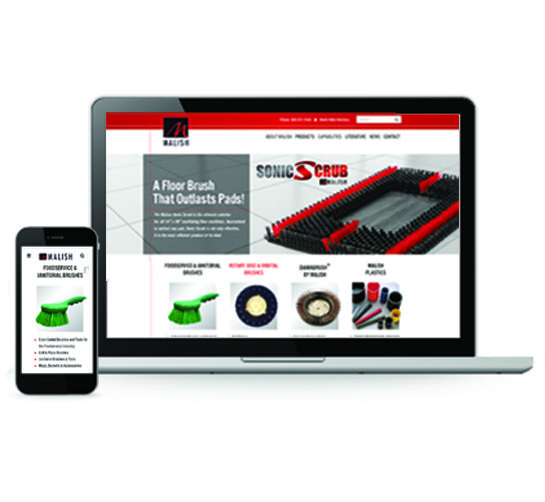 The mobile-friendly website immediately makes clear what products and services Malish offers. The visibility of OEM Services in particular has been enhanced dramatically. This is accomplished with large, attractive graphics and three easy ways to access pages. The first way is through drop-down menus at the top of the website. The second is via sliders on the homepage, and the third means of access is through static links further down the homepage. The desktop version of the website utilizes a “mega menu” option that allows the visitor to see all available products at once. The mobile version provides scrolling pages that are easy to use on a smart phone. Once a visitor drills down to individual product pages, literature and price lists are available complete with page-turning technology. All corporate contact information is easy to find on every page of the website, so questions can be directed to Malish personnel immediately.